Any fan of underwater hunting has not yet managed to do without special spear gun. 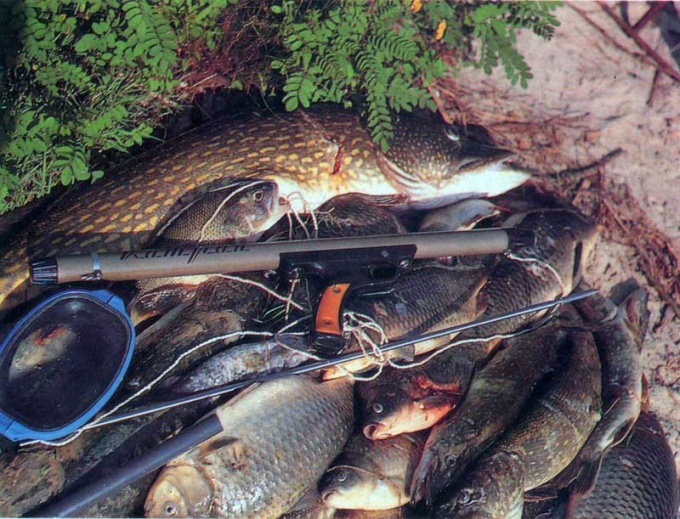 Harpoon guns are used to catch fish in sufficient depth, they, unlike normal shotguns don't use bullets. Shoot special underwater guns with spears or javelins. To do this the gun is quite simple, at the same time it is very reliable in operation. Cut the thread from both ends of the dural tube and cut a groove under staple, length 150-170 mm. Carved nadolnik and the plug. Drill the plug hole to harpoon. Clamp the plate to the arm in a vise and drill the hole for the barrel. Cut the contours of the arm and make a sample depth of 3.5 mm at trigger. Connect the two halves of the handle on the trunk and secure them with screws. Make trigger mechanism. This is quite a simple locksmith work. Make a harpoon in stainless steel. Sleeve, which carries the line needs to slide on the harpoon. It should rest on the shank and amortised through ftoroplastov ring. Cut out strips of steel lakobashvili and attach it with two screws to the stub shaft. The gun is ready. According to the method of firing underwater dart guns are divided into pneumatic and crossbow. In Russia the most popular air rifles, but their production is a process that requires special skills. 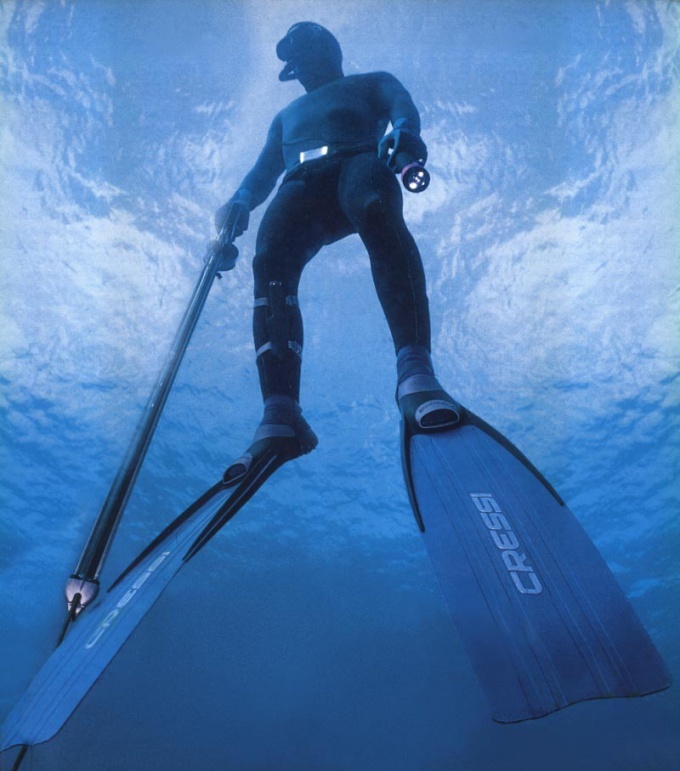 No fan of underwater fishing may not do without special gear for catching fish under water, which, as a rule, are underwater crossbows (special underwater rifle). They are the fishing gear at quite great depths. In such devices unlike conventional guns do not use bullets, but shoot special spears. wire of diameter 2 mm, stainless steel rod with a diameter of 6 to 8 mm (to be used for harpoon), duralumin tube with a diameter of 13 mm (to be used for trunk), two wooden plates for the handle (oak, beech, etc.) and heat-treated, special spring, with corrosion-resistant coating. Take the dural tube. Cut the two ends of the tube thread. This can be done with the help of special equipment or manually, no difference. Cut a groove under staple. The length of the groove should be approximately 160 mm. Blow the cover and nadolnik. Drill using a drill in the plug hole to harpoon. Take the prepared wooden plates for the handle and clamp them in a Vice. Plates can be cut the required size of oak, ash, beech and other hardwoods. Drill in clamped plates the hole for the barrel of the crossbow. Cut the desired contours to your arm. By making a selection under the trigger mechanism. The depth of this sample should be approximately 3.5 mm. Connect the two halves of the handle on the trunk and fasten with screws. Manufactured by simple metal working trigger mechanism for a crossbow. Make a harpoon. To do it should be of stainless steel. Attach it to the harpoon Lin, which is obliged to slide on him. Lin should rest against the tail, and to operate and amortised through special ftoroplastov ring. Take a strip of steel and cut out her lessonrating. Attach lakobashvili with two screws to the stub of the barrel of the crossbow. Gun ready, it remains only to insert a spear or dart and you can safely go underwater to hunt and wait for a good catch. Pay attention to what good the crossbow needs to have a convenient reel holder. It is desirable that it was easily removed, and also served as an additional guide for the harpoon, which increases the accuracy of the shot. Take care and harpoons. Craftsmen produce them yourself, but this kind of articles sin aerodynamic deviations, so few people can make an accurate shot with a homemade harpoon. It makes sense to buy tips for self-made crossbow.